I did it! I actually genrefied my fiction collection. Back in October I posted that I was thinking about doing it. After a week more of thinking about and convincing my assistant that it would be ok, we did it. It took us about a month and at times I was thinking "What have I done?" but now I think it is going to be wonderful. I was a huge undertaking and I weeded about 400 books in the process, but actually touching every one of my fiction books has been a real eye opener. Here are the steps to what I did. First, I needed to know what my genres were. Lucky for me our middle schools have been genrefying also so I mostly went with they had already set in place with a few exceptions. For example, they have a "Romance" genre and I wasn't going there. They also have a "Horror" section which I call "Scary". I wanted to add an "Animal Fiction" section for books with animals that drive the story like the Betty Birney Humphrey series, many of the books written by Bill Wallace, Black Beauty, etc. After talking with some other elementary librarains to make sure I had a good agrument, I had to state my case to my director and get approval. Our middle schools put animals that talk in Fantasy and animals that act like animals in their Genreral Fiction sections. However, at the elementary level, I do have students that come and ask for chapter books about animals and so I felt like it was warrented. Once I had my genres decided on, I had to figure out how I was going to label the books. Demco has some genre stickers, but there were some that I didn't like and I was also afraid that they would discontinue them at some point and I would have to switch stickers. So I decided to get white labels and make my own symbols. After making my labels, I starting pulling groups of books that I was sure about like the A to Z Mysteries, the Ramona books by Beverly Cleary, Andrew Clements books, the Animorphs series, etc. 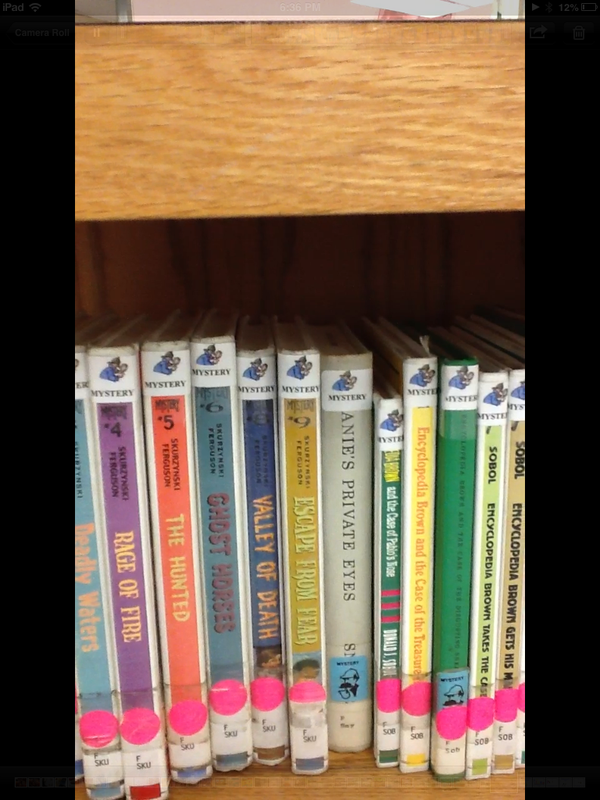 I pulled those off the shelf, labeled them and then put them back in the original ABC order by author's last name since the kids were still checking out during this process I didn't want to move them books until I had all of them done. Once I had done the major clumps that I was sure about, I started in the "A's" and pulled a cart-ful of books and went through them one by one. Some were very obvious and I knew right away what genre I would place them in, but I always checked one of my middle school libraries to see if they had the book and what genre they had put it in first. 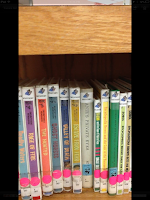 I also looked in the subject headings, read the summaries, asked other librarians and then it occured to us to ask the kids :) For example, I was not sure where to put the Magic Tree House books and of course our middle schools didn't own those. I thought they could be Historical, Sci-fi because of the time travel, or Adventure. One of the other librarians and I were chatting on the phone about it and she happened to have some 3rd graders in the library at the time. She called a few over and asked them why they liked the Magic Tree House books and they replied, "Because they go places!". BINGO - Adventure it is. From then on whenever I wasn't sure I would think where would the kids look for this book? (I decided this post would be too long all as one post, so look for part 2 in a week or so).